The Joint Committee of the European Supervisory Authorities (ESAs) published its final report on Big Data analyzing its impact on consumers and financial firms. Overall, the ESAs have found that while the development of Big Data poses some potential risks to financial services consumers, the benefits of this innovation currently outweigh these. Many of the risks identified by the ESAs are mitigated by existing legislation. The report concludes that Big Data brings many benefits for the financial industry and consumers, such as more tailored products and services, improved fraud analytics, or enhanced efficiency of organizational internal procedures. 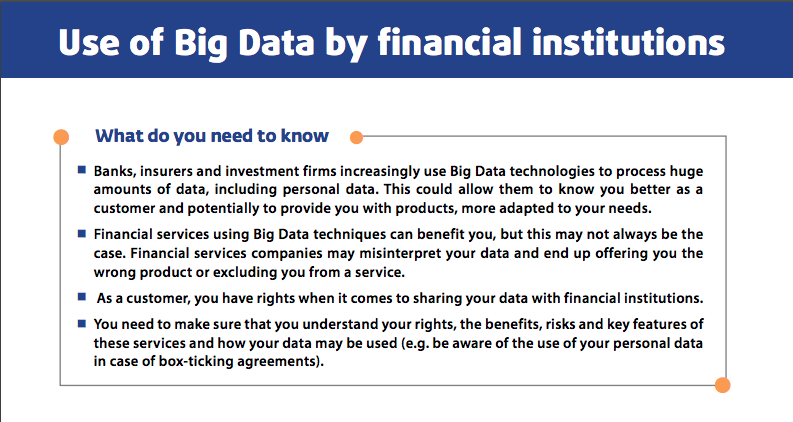 On the other hand, financial services consumers should be made particularly aware of some of the risks posed by Big Data. The risks identified by the ESAs include the potential for errors in Big Data tools, which may lead to incorrect decisions being taken by financial service providers. Additionally, the increasing level of segmentation of customers, enabled by Big Data, may potentially influence the access and availability of certain financial services or products.